1956 would have to be a major turning point in the history of education in St Albans for a number of reasons: the population had reached 4,000, there were 21 shops, and the old wooden hall in East Esplanade (the Mechanics Institute) that had been used as overflow classrooms for the primary school in recent years was pulled down and a new brick hall built by Keilor Council. This was possible because the acute shortage of classrooms in the area was finally relieved with the opening of St Albans East Primary School and the St Albans High School. The first buildings at St Albans High, western quadrangle. Construction commenced in 1956 and the building was occupied in 1957. I was part of this history in my own small way. We had come to St Albans early in 1952, via a two-year sojourn in the migrant hostels at Bonegilla and Watsonia, and moved into a one-room bungalow (sometimes referred to as a skillion) to accommodate the four of us, soon to be five. My sister Helen started at St Albans Primary in 1953. The following year I also was taken there to be enrolled, but the school was already full to the brim (according to family lore) and they told Mum to bring me back next year. I started school when I was seven, in 1955, at the little, old, overcrowded school that now features so often in people's recollection of "old" St Albans; it was the year before the era of the high school. In Victoria, children were legally required to attend school between the ages of 6 and 14 years; this upper limit meant that children were not allowed to leave school until the end of the term in which they turned 14. By 1957 there were already amendments drafted to the Education Act to raise the school leaving age to 15 years. So, the new area of local secondary education began when the first students of St Albans High School started on Tuesday 7 February 1956 in ... Sunshine. Yes, another first for the area, the first secondary school to start here was actually in another district and pupils had to take the train to Sunshine station to get there. Mr JA Barker was the first headmaster of the school. The school’s inaugural enrolment consisted of 126 students representing 27 nationalities; the 71 girls and 55 boys were segregated into separate classrooms, as was the practice in those days. Tuition started in the Presbyterian Church Hall in Anderson Road, Sunshine. The hall was partitioned into three classrooms with moveable room dividers while trestle tables provided the furniture requirements. One could say it was a good introduction to a multi-tasking environment, because people report you could always follow what was going on in the next class as the teachers were “shouting, bellowing or squeaking” to make themselves heard. 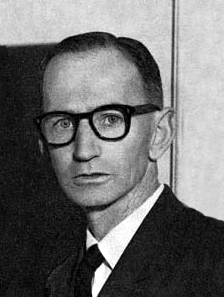 Mr James A Barker was the first headmaster; staff included Mrs Barker, Tom 'Doc' Walsh, Bruce Alcorn, Harry Lahy, Leo Murphy, Mrs O’Hallaran, and Mrs W Johnson as the office secretary. Leo Murphy was the Art and Craft teacher, and he’s the one who designed the “Truth Is Our Light” badge (see left) that was later featured on blazers and caps for the school. In the first school magazine Mr Barker acknowledged the uncertainties inherent in the school's temporary beginnings: "In a school composed entirely of First Formers, located in a kind of limbo, we hesitate to attempt too much ... [though we] feel that our present pupils are actually in advance of first form pupils in some larger schools." Before long, both staff and students were taking up the challenge by their achievements in educational, sporting, and extra curricula activities. Much appreciated as part of the geography classes were the visits to local factories. It seems that McKays-Massey-Ferguson was always a popular destination, and another one for this first year was the local asbestos factory where the works manager talked enthusiastically about the quality and range of their products. Don't times change? Bruce Alcorn gave many years of service to the school and was one the main people behind documenting the first 25 years of the school’s history (Where the Wind Blows: St Albans High School Silver Jubilee 1956-1981). He notes that the facilities were so basic at the start there wasn’t even a telephone available in the hall, so Mr Barker had to go and use the public phone across the road whenever he wanted to contact the Education Department. Each Friday afternoon the teachers had to stack the table and chairs against the wall so that the hall could be used for its normal purposes over the weekend - and each Monday morning they were there putting it all back into place for another week of educational endeavours. The boys had to walk about a kilometre to the Sunshine Technical School to take their woodwork classes, carrying their gear with them. The media had already started to hear about school and about mid year The Herald came out from town to do a feature article. It was the first of several visits over the next few years, especially as the publicity about Melbourne's Olympic Games focussed attention on national and cultural diversity. 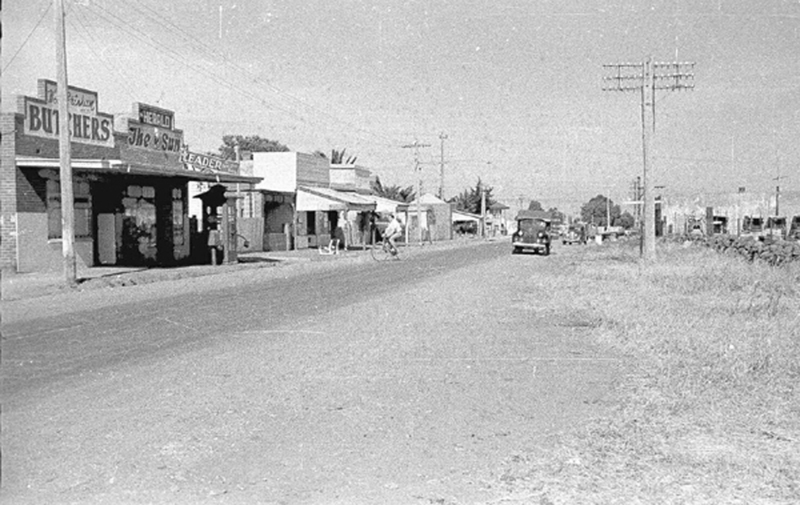 Main Road East from the railway crossing, 1954. Image (c) Kon Haumann. 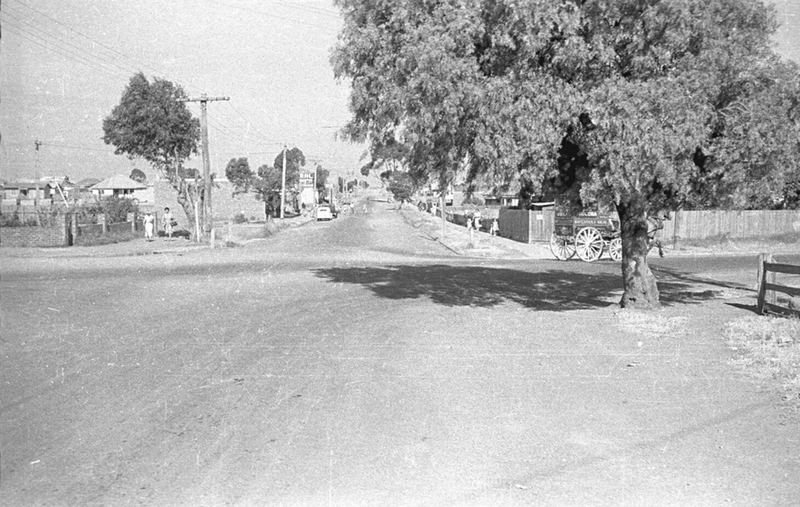 Main Road West looking towards railway crossing, 1954. Image (c) Kon Haumann. During term two, some ‘temporary’ buildings were being constructed in St Albans on the school’s permanent site, six hectares of land on Main Road East between the end of the housing subdivision off Percy Street and the empty farming paddocks farther east. These temporary constructions have been there ever since. Who was instrumental in finding the site for the school? If there was any one particular person it was probably Lorna Cameron, who, amongst many other contributions to community work, was associated with the school for at least half its current lifespan, through the School Council, the Parents and Friends Association, and as a member of staff during the early 'sixties looking after the library. Her role is acknowledged in Bruce Alcorn’s Silver Jubilee publication. Lorna arrived in St Albans in 1949 with a very pragmatic attitude to community work - if you wanted something to happen you had to work hard for it, and that is what she did. With a couple of young children in tow, she was quick to notice that the existing educational facilities were not going to meet the demands of the growing community. She joined other interested people to establish a kindergarten, which took about 10 years to achieve, because it was mostly community funds that had to be raised. New schools would be much quicker to establish once accepted as a responsibility by the education department, because public money would be used for their construction. However, there were many others who also worked hard for the cause, and the makeup of the school council over the years has included many of the major movers and shakers from local government and business circles. Councillor James Eddie was the first President of the Advisory Council, and he put in at least twelve years of service on the committee. In the mid 1950s, the little township was starting to fill out. Unfortunately there was no planning data available to the education department on the population growth for the area, and the bureaucrats hadn’t foreseen a need for extra classrooms let alone extra schools. It had, after all, been a static population for the last fifty years, and the primary school had coped with the educational needs of local children fairly well. The public servants had previously argued that, statistically, there was no indication of any trends that justified building extra facilities. The area was just a quite semi-rural backwater with a population of about 800, of which about 100 children were adequately catered for through the existing primary school. Then, suddenly, the small primary school was inundated with young immigrants who often didn’t speak a word of English and for whom there was no space in the classroom. There was so little space that new enrolments were put into temporary classes in the Mechanics Institute or bussed off to Ardeer. When Lorna discusses the circumstances at the time, she laughs and says the bureaucrats should have come out to St Albans and just looked around. There was a new family moving in for every day of the year - a thousand extra people each year is an amazing amount for a small community to accommodate, particularly when it never even had a thousand residents in all its history. You just had to walk up the street to see all the young couples moving in and the number of pregnant women on the streets to realise that there were going to be lots of children around very soon. You didn’t need long-term demographic statistics, you just needed a pair of eyes. Lorna says she found the sites for the high school in Main Road and the primary school in Station Street around her neighbourhood because there were many vacant blocks there; it was the eastern edge of the residential development at the time. 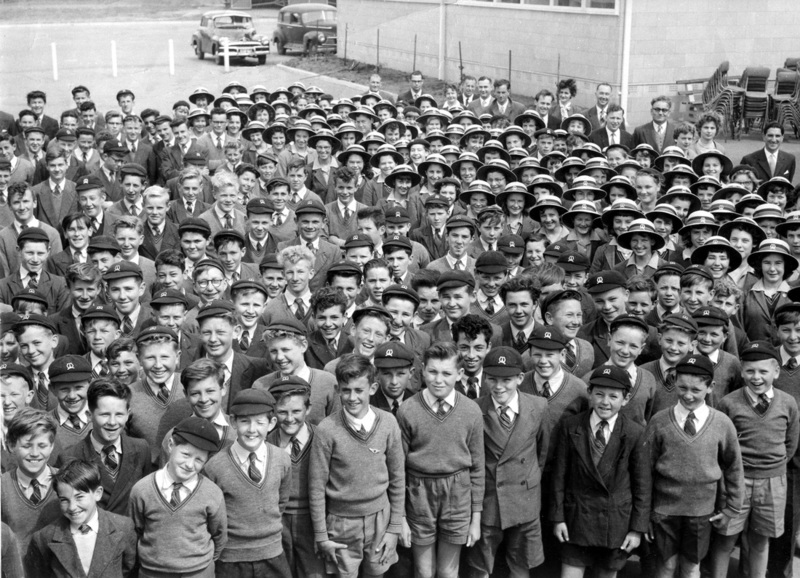 By the end of 1956, the first wing of the new school was completed on the site in Main Road East opposite Oberon Avenue, and was ready for occupation in the new year, so now local students would be able to walk to school. It would often be a very muddy walk in the wintertime, because most of the streets in the district were undrained dirt tracks that quickly became quagmires in the downpours. This was just a routine inconvenience for students, unknowing that there were deeper forebodings on the horizon that could effect their lives within the next decade. It’s no wonder that the most popular song for the year just happened to be “Sixteen Tons”. Ostensibly this was a cover version of a Merle Travis folk song about the coal miners of old Tennessee, but with the wisdom of hindsight I now recognise it as a metaphor for the moral burdens that society would pass onto this generation of students, because within the next decade St Albans High School boys were being enrolled in the big lottery to fight in Vietnam. One day my dad took me to a pub in Sunshine and I remember my first taste of lemonade as a revelation; at home I only ever had milk or water. The publican wouldn’t let young children into the bar, so it was a quick one in the doorway and we had to be on our way. Do you remember the taste of sparkling Tarax? Most of the Europeans had been accustomed to more relaxed licensing laws back home. It seemed natural enough that men would ask their friends if they had a spare bottle or two of beer over the weekend, it was a common practice, and I don't think they saw anything immoral or illegal about it. Even as a nine-year-old I was sent to a certain address to 'borrow' a flagon of wine. We all get introduced to the ways of the adult world at some time, though I never realised at the time that I was an accomplice in breaking the law. St Albans's flirtation with alcohol production started early, about 150 years ago to be exact. Charles Stenson had come out from England in 1854 and selected land near the Maribyrnong River at the end of Biggs Street. Stenson and his wife Emma terraced the riverbank on their property, which they called Maribyrnong Vineyards, where they planted the first vines in the area. This first vineyard was a failure, so they planted an orchard instead. A century later Paul Osicka and son were Czech immigrants who came to St Albans in the 1950s, planted vines near Puckapunyal and fermented their grapes in the chook sheds on their property in Kings Road so they wouldn't get caught by the licensing people. They had a sales outlet in Werribee and possibly supplied much of the local wine market in St Albans at the time, or is that just romanticised rumour? The father and son team (both Pauls) ended up moving to the Goulburn Valley where they revitalized the wine industry out there. More recently another local lad of the 'fifties, Giuliano (Julian) Castagna, is setting trends in the boutique wine industry for his biodynamic wines emanating from his Beechworth property. Such a pity these interests couldn't have combined to make St Albans the Napa Valley of the western suburbs, because in recent decades small wineries have been sprouting up in places like Keilor and Rockbank, while in St Albans it is only the European back-yarders who continue their bacchanalian production customs. Demographically, St Albans was going through incredible change. After little growth for decades, between 1953 and 1955 the population suddenly quadrupled, an increase from 1,000 to 4,000 people, and it would double within the next five years, so the growth was quite phenomenal. 1956 was the start of many technological marvels, some not so desirable in retrospect. In Maralinga, South Australia, the British exploded their nuclear test bombs with assurances that the explosions posed “no threat” to anyone. Australia was also joining the nuclear age and its first nuclear power reactor would be operating within a couple of years. Of greater immediate impact locally was the introduction of television to Melbourne in 1956 when the ABC started broadcasting, just in time to show us the Melbourne Olympic Games. We were indeed the focus of the world’s attention for a fleeting period and still have Olympic Park as a reminder. For the record, Australia put on its best performance ever in the Olympic Games and was awarded 13 gold, 5 silver and 18 bronze medals; it came third in the overall medal tally: Russia came first, followed by the USA. Johnny O’Keefe became Australia’s first rock’n’roll star, and television would certainly help his career before long. It was the start of a relatively new phenomenon in catering for the interests of youth and the creation of a TV-focussed generation of teenagers. Wherever there was a television, the young became ardent fans of The Wild One’s Shout and Six O’clock Rock shows on the ABC. A few years later they would graduate to the commercial channels to follow The Go!! Show and Kommotion. American singers were popular: Doris Day, Connie Francis, Buddy Holly, the Everley Brothers, and of course Elvis Presley. I don’t think too many local people had a TV at the very start, but there was a tantalising glimpse offered to the public. Opposite the railway station in East Esplanade, some adventurous shopkeeper had put one of the first televisions in the area on display in his front window. One evening my father took me there to see this new phenomenon, and I must admit it was a marvellous sight. While the Mickey Mouse cartoon characters were cavorting on the screen, the equally bugged-eyed youngsters on the outside were squeezing into a vantage point to see what was happening. These little gatherings were happening elsewhere, because the initial price of about £300 for a television set was a fair whack out of a working class budget; still, for some people there was the never never ... If you were lucky your local milk bar might have a TV up on the counter, and that meant mum would always have a volunteer willing to make that early evening trip to the local store to replenish supplies. On the first day of the school year in 1957 the real St Albans High School was open for business on its home site, which Laurie Schwab was later to describe as being "perched on mud in the winter, dust in the summer; two grey bunkers in single file". However, that wasn't a problem for the moment, as the novelty of the new school was greatly enhanced by the drama of a grass fire and the consequent visit by the fire brigade. What more could a new pupil ask for? With a fresh crop of faces straight out of primary school now on the scene, the old '56ers rightfully took their place as the seniors of the school. They are a unique group in the history of the school, because they were the seniors from the very start and all the way through until they graduated. Sometimes assumed to be the first assembly at St Albans in 1957, this photo is actually from 1958. The Electra Drama Group was formed by Doc Walsh and drew on his Williamstown High School experience and contacts as well as recruiting actors and support crew from St Albans. It was an activity that was independent of the St Albans High School but closely connected with it through its participants. The initial performance of this new cooperative venture was "Money by Wire". As well as the interstate performances during May, the drama group also entertained their parents and colleagues at a local venue. The group's preparation for the tour was even televised by the ABC, which was excellent media coverage. I wonder if this connection with television broadcasting may have encouraged participants like Giuliano Castagna to later join the ABC? Apart from the opportunity for personal development inherent in such new experiences, the proceeds of these activities all went to charitable causes, so it was also a civic contribution. Talking of broader civic responsibilities, registration for National Service was still a compulsory requirement though it did not, as yet, impinge on the consciousness of us youngsters. The first global news that I recall having the boys at the St Albans East Primary all agog was when the Soviet Union launched the world into space with the Sputnik, the first man-made satellite to circle the earth. We talked about it at recess and lunchtimes; some boys bragged that they had seen it like a slow-moving star tracking across the night sky, some that it was like a shooting star. I had never seen a shooting star, so I wasn’t sure what they meant, but I was impressed anyway. In England, perhaps one of the earliest nuclear accidents occurred after a fire in an atomic reactor spread radioactive material over the surrounding lands. I remember hearing much talk about the Sputnik but none about the nuclear accident. Though a high school magazine was printed during the first year, as yet it did not have an official title. The 1957 edition is the first to have used the name "Alba". According to the editors, the name was chosen for the magazine because it was a Koori word from the Cape York Peninsula that meant “a windy place”, which was a neat encapsulation of the local experience, plus it had a resonance with the English-derived etymology of St Albans the Martyr, after whom the local area was named. In 1958 the school took in another 200 students, so it was growing quickly. As noted in that year's Alba: "A school of 560 of whom some 440 are in the lowest forms poses special problems and difficulties which call for tremendous efforts for staff, pupils and parents alike." Such efforts were obviously forthcoming because the school not only survived, the kids also enjoyed themselves and won glory for the school. In May 1958 a cast of young students, otherwise known as Mr Reid’s drama class, won the Victorian Drama League competition for best one act play in the secondary schools division. This really was a first achievement that started to make other areas take notice. The drama class tackled Thornton Wilder's "The Happy Journey" with a panache that had even The Age reporting it as the highlight of the evening: "The American accents were sustained surprisingly well, the acting was even and competent, and GA Reid's production was both expert and charming." (6.5. '58) The cast for the performance comprised Jeff Barlow, Carolyn Biele, Switlana Bohudski, Graeme Bolitho, Douglas Markham, and Vanda Viti, who even got her name mentioned in the paper for her dry humour and self-assured performance. As if that wasn't enough accolades, The Age had another notice a couple of days later informing the public that the St Albans team had won against much more experienced groups. In the adjudicator's opinion: "This group of young actors took a very difficult and complex play and performed it with distinction. They were expert and confident, tremendously professional, and it was most enjoyable theatre." (8.5. '58) As they say in show biz, that's a hard act to follow. At the more muscular end of exploring new heights, five busloads of students scaled the slopes of Donna Buang as their long distance excursion for the year. Did they find any snow? Probably, because some teachers certainly experienced the effects of hurtling snowballs accompanied by giggles from anonymous sources. In July the first of the school socials was held. There were also the usual fundraising efforts, choral and theatrical concerts, a bottle drive, and even a pet show in aid of the Anti-Cancer Council. In October, 15-year-old Nina Diakonow from St Albans made it into the centre pages of The Sun for her fine performance in winning the 75 yards, 100 yards, and broad jump events at the Metropolitan High School athletics, Olympic Park. Another first for the school! And finally, after two years of operation, the new building was officially opened by the Victorian Minister of Education on 14 November - the public face of the education department had finally made its way into an enclave of the European Diaspora where enthusiastic teenagers with unpronounceable names were starting to make their presence felt. The Minister must have been impressed to see about 300 parents and friends turn up for the occasion. However, the official ceremony was interrupted by rain, so the students retired to the classrooms while the dignitaries continued with their speeches over the class loudspeakers. The unpredictability of it all was enough for the good-humoured Minister to admit that “Some of you may be fortunate enough not to hear,” as he took up the microphone for his turn at speechifying. 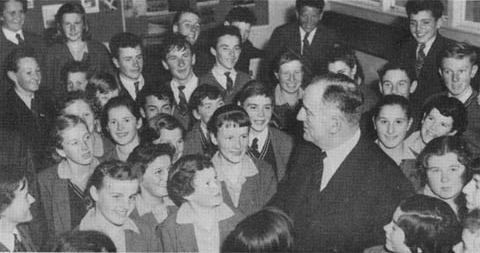 Mr John Bloomfield, Minister of Education, with some of the pupils at the opening of the school, 1958. By this stage the local population had reached 7,000 people and the student population had reached 3,100, compared to only 100 a decade earlier. About one-third of the current students were attending the Catholic school, so it was already quite a big school. The high school had 550 students, catering not only for the local teenagers but also for some from the schools of Albion, Ardeer, Deer Park, West Sunshine, and Sydenham. In fact the students had really come from all parts of the world. The multicultural character of the school was obvious to everyone from the start: 83% of the students were from overseas, and the school even held classes in German, Italian, and Russian. It’s a credit to everyone concerned that the success was immediate and continuous; as I’ve always maintained, St Albans was multicultural before the word was even invented. When we first arrived here we all lived in little multicultural clusters that probably spoke half a dozen languages between as many households. Multilingualism was natural, it was what you grew up with. When you went to school you found the same thing was repeated, at a bigger scale, so it was natural to get on together. The first group of fourth formers sat for the external Intermediate examination in 1959, and did so well that the school was approved to hold this exam internally from then on - another first for the '56ers. It was also the first year that the school magazine was printed. This was the year my older sister started at the high school, so I at least heard about its existence in a more direct way. Though the new building was reputedly only a temporary construction, the central block of the school stayed in this temporary state for the next twenty years pretty much unchanged, but expanding every now and again as incoming students replenished the graduating first-formers. These early classrooms are now called “Light Timber Construction”, which sounds so much better than temporary. Activities for 1960 illustrate the variety of extra curricula interests of the school. Drouin High School came to St Albans on a sports and the students competed in football, basketball, softball, and vigoro - to the uninitiated who've never heard of this game, such as myself, vigoro is a cross between cricket and baseball played by two teams of 12 girls a side, using an oval shaped bat. Two bowlers bowl alternate balls from one end of the wicket pitch, and the batters must run whenever the ball is hit in front of the wicket. The game was introduced to Australia in 1919. Now you know. The swimming sports at the Olympic pool had an extra challenge this year, because it was the first time that St Albans was represented amongst the competitors. Visits were arranged to the Essendon Airport, the Royal Show, Ben Hur, Bacchus Marsh, and the drama festival at Brighton. Furthermore, the school held its first ever Debutante Ball. Not all activities were fun and games. The school also contributed to the social good of the community by collecting £36/17/- for the World Refugee Appeal, £53/5/- for the Good Friday Appeal, and 102.5 dozen eggs for the Footscray Hospital Egg Appeal. I'm sure there must have been an explanation for the latter challenge at the time, but what did they do with all those eggs? The social highlight for the year was undoubtedly the Debutante Ball on 16 September, organised by Mrs Barker. Fourteen belles and their escorts held their coming out ceremony at the Youth Club hall, much to the delight of their proud parents. 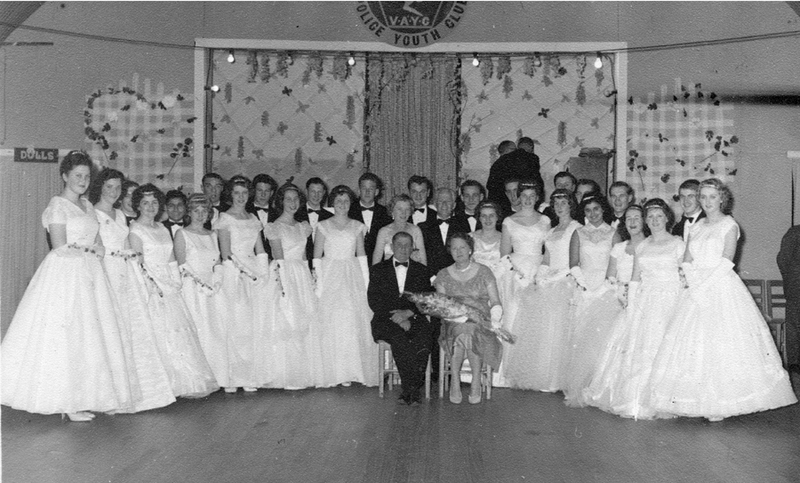 Mr and Mrs Barker with the St Albans High School debutantes at the Tin Shed, 1960. The local housing market was still growing as old farming acres were subdivided into more residential land. You could buy a new weatherboard house for about £4,000. Active at the time were the Stevens Brothers, JA Setek and Co, Keith Mann, Grand Real Estate Agents, and St Albans Home Builders, to name a few. Mindful about the problems of unmade roads, Keilor Council had passed bylaws requiring developers to install roads with curb and channelling, a provision of which some developers were critical because it increased their costs. Many residents from the older areas were delighted to see the start of more road construction occurring in their areas. Mr J.A. 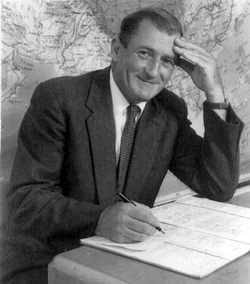 Barker had been the headmaster from 1956-1960. His first name was James but he was always addressed as Mr Barker. In those days it was considered impolite for students to refer to their elders by their first name. Max Wilkinson was Principal in 1961 when I started at the high school. He was a tall, gaunt-looking man, who sometimes had a ready smile. "Not your surname. What's your first name?" "But sir, that is my first name." The School Advisory Council members from early years are also mentioned in the school magazines. Students didn’t really have much to do with the Council directly, though I am sure that councillors played a critical role in the school’s development and probably deserve recognition and acknowledgement. It’s just that those positions were largely invisible to the student populace. The direct interface between students and councillors hardly existed. Perhaps if you were on the student representative council ... ? I recall standing through some of the official speeches as the whole school was lined up in the eastern quadrangle. I remember Mr Eddie’s name, so he must have been a regular guest speaker, but more so because one year the head female prefect very sincerely thanked him for “wasting his valuable time” before she realised her gaffe and then performed some pretty impressive verbal gymnastics in correcting herself before the words had finished echoing round the loudspeaker system. The school was constantly trying out new ventures. This year it was the first high school in the state to have a full-time counsellor, a psychologist by the name of Rosemary Meyer, whose chief concern was to help students in improving their work and increasing parents' understanding of the education system. I, for one, never even realised such a person existed. In 1961 table tennis came to the fore as an activity when Jack Carrington, a visiting table tennis expert, selected a number of St Albans High School students amongst the first batch that he took for coaching, including Ray and Lindsay Chatterton. Lindsay’s style of playing was highlighted as showing ‘great promise’. Given that Lindsay was a first-year rookie at the school, that was great praise indeed from the famous Englishman. Unbeknownst to most of the school, young Lindsay’s table tennis talents were honed on the back porch of his home in Sydenham where he would quickly demolish any opposition unwise enough to challenge him to a match. What's even more remarkable is that this was achieved despite a stature that was nuanced so succinctly in that rhyming couplet: "Roger Kuc is rather small / But compared to Lindsay he's rather tall." Lindsay’s table tennis career peaked when he won the Victorian championships, and after that he took to tennis, Bob Dylan records, and motor cycles as his distractions of choice. I also started high school that year, 1961, and though I never developed any real sporting prowess, I was one of the select few given Responsibility early in my academic career. However, I must admit that the IM after my university qualifications does not refer to membership of the International Monetary fund; it stands for something more select in local academic history - I was an Ink Monitor. I still remember the days of scratchy nibs mutilating cheap paper as we dutifully copied the teacher’s notes from the blackboard, until, inevitably for thick-fingered chaps like myself, the dribble of excess ink on the forefingers resembled some horrendous skin disease. The first year was also loaded with decisions: do you want to study French, or German? I had never before made any decision about my education and suddenly there you are ... choose. I chose German because some of the families in my neighbourhood spoke the language. I didn’t know anyone who spoke French, so what would you use it for? So here I was in Grade 1C trying to learn the intricacies of masculine, feminine and neuter endings in the nominative, accusative, dative, and genitive cases under the guidance and sometimes failing patience of Mrs Sturesteps - you’d have to have patience to put up with the rowdy behaviour that developed once the awe of a new school and new teachers had diminished. We were a class of nearly 40 students, half boys, half girls (does that mean we were androgynous?) so between 1956 and 1961 the policy of segregating the boys and girls must have been abandoned within classrooms, though it was still enforced in the schoolyard during recess and lunchtime. With such large class numbers it must have been impossible to give any attention to individual learning needs. Mrs Sturesteps clearly loved the subject much more than many of her reluctant and recalcitrant students did, but she persevered. I enjoyed studying German. The delights of educational exploration come in many forms (no pun intended) and some prepubescent lad with a bit of idle time discovered that rolled paper scraps soaked in ink made a formidable missile when launched by an elastic band. One of the more classically oriented aficionados - who shall remain nameless even though we did call him Michael Hatjiandreou - claimed the ruler technique required more skill and was thus more worthy of admiration. In either case, the satisfying thwack of an ink-sodden pellet hitting its intended target was said to be heard above the noisiest of classrooms; the reaction certainly was. We in the Ink Monitor ranks deplored such behaviour for being sacrilegious; it would never have happened at the Catholic school, because the nuns were too sharp-eyed and strict to allow that to have been perpetrated more than once. Sister Charles would not have approved. Alas, my aspirations of leadership on the IM front were short lived, because sometime in the early 'sixties the bureaucrats running the education department finally came to terms with a technological breakthrough that was first marketed in 1946 - after initially being banned in Victorian schools (I kid you not) the ball point pen was finally allowed to be used in the classroom, thus putting a generation of ink monitors and ink well manufacturers out of business. I’m sure Mr Biro must have been pleased every time he read his bank statement. High school was also an opportunity to make new friends and reestablish contact with fellow students from the earlier years in state school, such as Nick Szwed from the East Primary. Otto Czernik was one of the new contacts, as he had been attending St Albans North School. Otto was also a rather shy and retiring person, and perhaps that was our common feature that would establish a long-lasting friendship. Otto had developed an interest in electronics fairly early in life, goodness knows from where, and he was quietly progressing this hobby in his own time. It was Otto’s interest in crystal sets that introduced me to the world of the ABC, jazz, and classical music. We had a valve radio at home, an old Bakelite Astor with a 78 RPM record player under the top lid, but that was only turned on at special times. We didn’t have personal radios in our households, though in the next few years the mass production of the transistor would permanently change the relationship between family members and their radio console - the personal “trannie” receiver was on the way. Otto helped me build my first a crystal set, which introduced me to a new world of music. I eventually built a mains-powered valve receiver based on the superheterodyne feedback system, but the simple crystal set was my pride and joy for quite a time. Because the ABC transmitter was located on the outskirts of St Albans, it produced a strong, easily detectable signal, and listening late at night I became familiar with Arch McCurdy’s Relax With Me jazz programme, and a variety of classical music scores that I had never before experienced. In those days the most popular pop stations were 3UZ, 3AK and 3DB. This was in the days of AM - amplitude modulation - so the broadcasts were all in mono rather that stereo. Of course, the best thing about crystal sets was that they didn’t require any power, so I was able to have my first personal radio even though I had no pocket money to buy batteries. The school library was another discovery. Lorna Cameron was the librarian, and if I recall correctly every class had a library monitor, though I can’t remember what they actually did. Lorna was keen for students to read good literature and would always know which book might interest you. As Jutta Heymig says, sometimes you might want to read something light by Mary Grant Bruce (or, heaven forbid, a reread of an Enid Blyton), but if Lorna saw you getting the junior stuff she’d soon take you to the section that had things “a bit more interesting”. I started reading as an interest in itself rather than just as a necessity for schoolwork, and the love of books had stayed with me since. I also enjoyed woodwork. Metalwork wasn’t bad, but I loved the feel of a good, sharp plane peeling paper-thin shavings from a plank. My father had been a very good handyman, and since his death I had dabbled with some repairs and odd jobs around the house, so I had an affinity for this activity. The only claim to fame for me in this class was when I was given 105% for one of the models we were required to make, a nail box that I still have, though it’s rather battered these days. I'd heard woodwork referred to as "sloyd" a few times, which seemed a most unusual word as it was hard to fathom its origins. I later discovered the word was of Swedish background, but if anything that only enhanced its etymological mystery. Mr Wilkinson stayed only the one year and was replaced by Brian Torpey, who was el supremo from 1962 to 1968, so he and Barker really shaped the progress of education at St Albans High over the crucial first decade or so of its existence. Torpey was of shorter stature than Wilkinson and more severe in appearance; I don’t remember ever seeing him smile (though there are photographs that prove he did) but I usually tried to avoid being noticed by such authority figures. Wilkinson came back during the seventies and stayed for several years, so he also put in his time in St Albans, but that was after my era. Teenagehood is about developing a sense of personal identity, and much of that is associated with peer groups and their activities. The music of the sixties was avidly followed by most of us and certainly became part of a shared experience. In 1962 the Beatles started to make their presence felt from Liverpool, England, and their music would dominate the pop charts and our collective music consciousness over the decade. British pop was taking over from the Americans, and groups with their trendy Carnaby Street suits as uniforms set the standard for their Australian wannabees. Then along came The Rolling Stones, and it was all a vinyl nirvana for the aural senses. Of course the secret of this music was to play it REALLY LOUD whenever you could, which is probably why our generation now has such a high incidence of tinnitus. By now the St Albans population was about 8,000 and there were 78 shops, so the growth was still occurring at a rapid pace. In 1963 Britain, the USA, and the Soviet Union signed a nuclear test ban treaty that banned the testing of nuclear weapons in the atmosphere. For myself, 1963 was the year I started working at a fruit shop after school and on Saturday mornings; it was job I would keep at until I left the school in 1966. Having a little bit of regular pocket money was a nice experience, but it was only a little bit, as I gave my pay to Mum to contribute to the household expenses and my education expenses - when you have no money, any bit extra is a bonus. I remember that I was working at the fruit shop in Main Road West on 22 November 1963 when someone told me that President Kennedy was shot by a sniper. It seemed that everyone was talking about it because he was such a charismatic world leader, admired by many Australians, and yet he was killed by a fellow American. The world indeed seemed a crazy place. However, world events did not dominate our extra curricular activities at school; that was reserved for a more fundamental interest - having a good time. Each recess and lunchtime was filled to the brim with activity: kick-to-kick football, soccer, and poison ball were popular; in fact anything that involved running and chasing or throwing a ball. Herbert Pryhota was always an excellent high marker and deserved to become a football hero. I wonder what happened to him? Here also the natural classroom athletes like Joe Attard and Henry Goralski would outpace the rest of us without raising a puff. The back-breaking pyramid building of British Bulldog was more of a time-filling exercise in the morning or during any short recess. There was some controversy about why soccer was not offered as part of the normal sport activities, in spite of very strong advocacy from Victor Mahorin and a group of interested seniors. Students lobbied for the cause through their own magazine and Doc Walsh took some pains to address the matter in his own little publication "Practical Prattles" to justify why it couldn't be done. It was a time when football meant only one thing - the Australian Rules Football code as played in Victoria and just about nowhere else - and there was no room for that foreign game. Strangely enough these conditions didn't seem to apply in 1960 when the school was smaller but in fact was able to field a soccer team. Isn't it ironic that Australia has now been trying for decades to break into the higher rankings of International Football, i.e. soccer. The boys in my form used to play it at lunchtime with a tennis ball. You could always make your own opportunities if you tried hard enough, but it was only recreation, not a political statement. Baseball became a growing interest for some boys, who stayed after school several days a week to practise under the watchful eye of Barry Rayner. The volley ball players, Otto Czernik, Peter Nowatschenko, the young Kruk triplets, and others would take their more restrained exercise beside the shelter shed. Mr Pavlov was a major inspiration for the volley ballers, some of whom went on to more exalted competitions after high school. Such strenuous activity had side effects more obvious to the teaching staff than the boys, particularly in the summertime, when some of the male teachers made not so subtle comments about the requirement for fresh air as they ordered the windows to be opened. Mrs Burden, one of the maturer female teachers, even spoke to me after class about the problem with “some of the other boys” who probably didn’t change their socks often enough. She was being very gentle and discreet. I thought it was very nice of her to be worrying about the other boys (I was terribly naïve) but was relieved that I didn't have to explain to her that I only had one school outfit myself and that the washing was only done once a week. Why would you need to change your socks more than once a week anyway? We had a bath once a week in the old wash basin that we'd used since early childhood, with mum heating the water in the old copper out in the shed and carting it in by the bucket load. Besides, we didn't have running water in the house yet; that came the following year when my sister started working and could afford to pay the plumber. The school administration was very strict about uniforms; wearing white socks was like waving a red rag at a bull, for reasons that escape me still. Goralski liked white socks, if I recall correctly. Some lateral thinking lads found a way of exploiting this school obsession to their advantage. Thanks to Stefan Czyz and his cohorts Doc Walsh had implemented procedures to make sure no boys could skip out of playing sport, which stymied most of the reluctant set ... until a couple discovered that turning up for sport wearing a one green and one red sock, for example, resulted in you being suspended from sport that afternoon for being improperly dressed. How those poor boys suffered! "In second and third form the dress code was about rolling your shirt sleeves up no more than two inches from the wrist and making your pants as tight as possible. The school jumpers got longer and longer, and one chap was suspended because of the length of his jumper, so we ran a letter campaign through the local paper on the theme 'What length freedom?' Skirts became shorter and shorter. It was a time of heady romance and hearty loins." Norm McLeish was our English teacher for a while, and he was always trying to introduce a bit of novelty into the classes, such as acting out the roles from some ancient Greek or Roman play rather than just reading it as an exercise. He stirred an interest in poetry by getting us to do parodies on Hilaire Belloc's "Tarantella" or Keats's "La Belle Damme Sans Merci" and introduced us to the resonance of Mathew Arnold's "Sohrab and Rustum". He must have got bored with reading our essays, because one day he challenged the class to let our imaginations run wild and come up with a hundred alternatives for the verb ‘to walk’; it seemed that that was about the only ambulatory word that anyone used in their (not so) imaginative writing. And by golly, several of the class actually did it as they sidled, slithered, sauntered, sneaked, skedaddled, and scurried across the room to hand in their paperwork. It was all in good fun and taken as such. 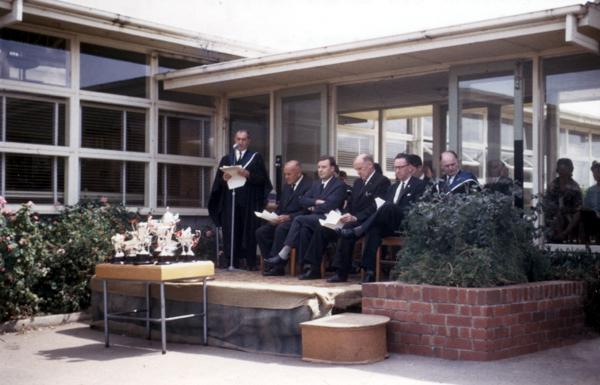 Mr Torpey and guests at the annual speech day, 1963. Many teenagers of the 'sixties would remember 1964 as the year the Beatles come to Australia; the size of welcoming crowds was almost unbelievable. There were Aussie artists also making a mark on the local pop charts, including groups such as Billy Thorpe and the Aztecs, and the Bee Gees, who had migrated from England in the first place. 1964 is also remembered for Menzies' reintroduction of conscription, in the form of selection by ballot of 20-years-olds - boys who were not old enough to vote were considered old enough to fight and die for their country (18-year-olds finally got the right to vote in 1973). Stories of some of the first Australian servicemen being killed in Vietnam began to appear in the newspapers. Probably very few of us had ready access to newspapers, but the growing popularity of television and the ubiquitous transistor radio spread news very quickly. 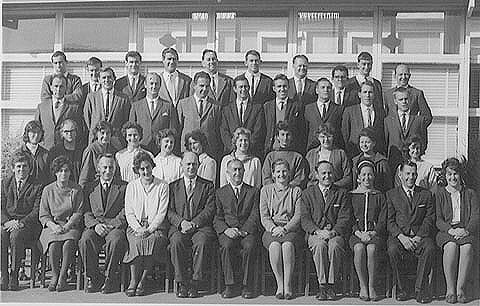 The staff of St Albans High School, 1964. In 1964 my home class had about 23 kids, with 7 girls and 16 boys. This was a combined class, i.e. students taking the French and German language classes were in the same form, whereas previously they had each been in separate streams. Miss Joan Butler was the Form Teacher either that year or in 1965. I think she was a recent graduate and had that keen and interested attitude to education; she was bright and cheerful. We all liked her, and, for the boys at least, that meant being as cheeky as we could get away with in order to get some reaction from her. We certainly succeeded in doing that on various occasions though she was always resilient enough to accept our boisterous pranks for the attention-seeking behaviour it was. I had my one minute of fame the time she read one of my essays to the class as an example of good writing, which earned me some good natured ribbing from my classmates. Joan Butler and Ivan Matthews explored classic Shakespearean poetry and plays, which sometimes had a hidden racy element that was quite surprising to discover for a young lad of Catholic upbringing, such as myself. As you would now probably suspect, I was much more surprised when we read "Lady Chatterley's Lover". The mid 'sixties was a time of fundraising for a school assembly hall, which for students meant raffles, raffles, raffles, and the occasional white-elephant-jumble-sale-monster-fete (the really big one was in 1964, though this is disputed by many subsequent years) as latent business acumen was stretched to its limit for new ideas in raising money. The domestic science classes churned out enough toffees and jaw breakers to delight the local sweet tooth market many times over. The penny drive was avidly supported because there was a promise of the afternoon off from school if the pennies reached the front gate; some adventurous boys thought they had found the solution but, unfortunately, spacing the pennies one yard apart wasn't within the implicit rules. Other students went so far as to door knock their neighbourhood for odd jobs; a few hours of weeding the garden might get you the equivalent of two dollars to donate to the cause. Teachers were also involved in this process but none of them have told their version of events. Mr Bolvari must have had one of the most innovative ideas by producing a weekly crossword in French and awarding prizes to the winner - obviously a win win situation. 1965 was another formidable year of space conquest, because an American space craft landed on the moon, while a Russian cosmonaut was the first person to walk in space. Of more immediate impact on the lives Australian teenage boys, in March 1965 the first lottery of 20-year-olds was held for the compulsory Vietnam service. As well as the physical and geo-political world to deal with, there were the debating classes that posed political and moral issues behind the scenes as well as in the formal debates - power and politics, conscientious objection, spirituality and faith - they were there to be explored if you were willing to take part in formal and informal discussions. I forget who encouraged me to join the debating club, though several teachers supported this activity over the years, including Alcorn, Matthews, McLeish, and Butler. I think Mr Patterson formed the club in the early 'sixties and Doc Walsh also participated in training speakers. I took part in the club in my senior years there and for a while it was all keen enthusiasm to learn the art of debating and compete against other schools. Topics were often provocative, such as taking an assertion such as “It’s better to be Red than Dead” and coming up with all the rational arguments for your side. It was a good introduction to public speaking and teamwork. Speaking of the rational world, I'm not sure when the penny first dropped for me - because it was something we all experienced constantly and therefore disregarded its significance - that St Albans was actually a metaphysical construct that was loosely based on the spatial-temporal concordance of three distinct universes. I think it was watching all those Doctor Who episodes that finally gave me the clue about unexplained space-time anomalies. The older immigrants lived in their own world, which happened to coincide with the St Albans boundaries, but their world was always known as "Sun-Tahl-Buns" and that is how they referred to it all their lives. The locally-born populace lived in the same space but on another plane, for they lived in "Sane-Tall-Bins", a world of smaller demographic mass but infinitely greater dominance in shaping the observed reality. And finally, there was the academic world of the intelligentsia, who really operated at the ethereal level, and they lived in "Snorbens", where the more subtle oral and aural conventions of society are passed on almost imperceptibly from teacher to pupil alongside the overt curriculum. Growing up in St Albans you instinctively learnt to traverse these boundaries so as to be congruent with whichever of the universes you were entering. So, you can see that "St Albans" really exists only in the Gutenberg world, and the name survives because it is a convenient compromise. At least it does stop the rest of the world from becoming more confused. The ethereal world was productive that year, because the academic results were substantial, with the senior students accumulating 11 first class honours, 39 second class honours, and 13 commonwealth scholarships. 1966 introduced a number of changes to our way of living. Most significantly, for the young men facing conscription, Menzies confirmed that Australian troops were being sent to Vietnam. After many months of preparation, decimal currency was finally put into circulation in February 1966. This created interesting little conversion exercises for students to calculate whether they were winning or losing on the exchange; this was economics at its most micro level. The more worldly adults were probably distracted by a far more momentous diversion, when six o’clock closing for pubs was extended to 10 o’clock. Suddenly the ritual of the six o'clock swill was out the door, and just like that the many years of mateship and rugged male bonding had lost its traditional stronghold. Nevermore. In 1966 the ban on the employment of married women in permanent positions in the public service was finally lifted in Victoria. And was it not indeed a Victorian attitude that married women should not have permanent status in the public service in the first place? The rate of local population growth was now much less hectic, but that was partly because the net annual increases were adding to an already substantial population base. In 1966 the city of Keilor already had 43,000 residents, while Sunshine had significantly more at 69,000. With such a plethora of change at the macro level, a line had to be drawn somewhere, and it became more imperative in the aftermath of the hirsute practices of the Beatles and the Rolling Stones. That definitely had to be stopped. Graham Snooks and David Dusting became nonconformists by confronting the political correctness of the hairstyle agenda - you could say they grew their way into notoriety - until the school's big guns came out and laid it on the line: get your hair cut or leave. They were serious. Snooksy's career path was foretold back in 1961 when he started at the school and some muse quipped: "The brainiest kid in our form is Snooks / Whose always got his head in books." This was very aptly put, because Graham developed a bit of a reputation for seeking out the local bookmakers, purely for academic purposes we are told, and that must have been good practise, because he eventually qualified as an accountant. Form 6 had some privileges, especially as we had the new science block to ourselves. Apart from the education amenities, it was a great spot to play cards during recess. Five Hundred was the game in vogue, and it occupied a quartet of players and audience through many a lunchtime session. 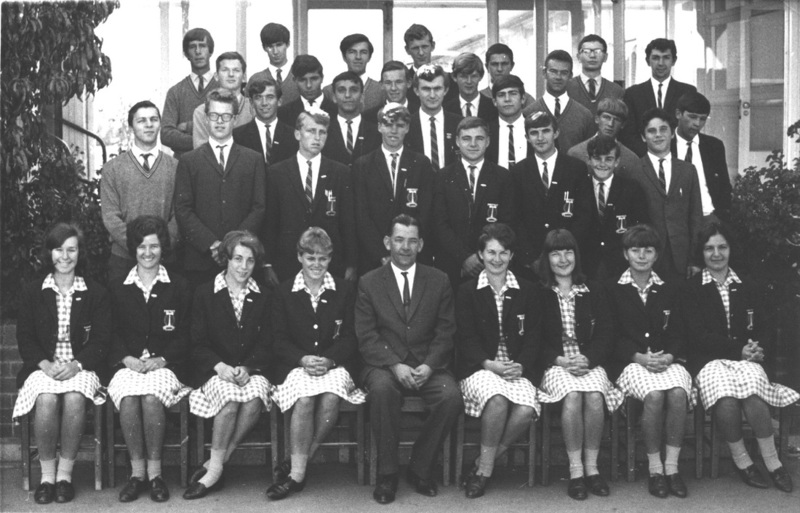 Mr Bruce Alcorn and senior students, 1966. Previously, the chemistry labs were near the central office. I was there in the sixties when some of the experiments strayed from their prescribed routines to explore new possibilities in elixirs that bubbled, fizzed, and fumed. It’s amazing how the mind of the male species can be eternally fascinated by the odour of hydrogen sulphide (rotten-egg gas) and think it appropriate that the rest of the school should share the experience. The purpose-built science block was added in 1966, and was the perfect setting for the new science curriculum with budding chemists fiddling around with chemicals and memorising the minutiae of the periodic table, while putative physicists experimented with Newtonian law while contemplating Einstein’s Theory of Relativity. All I can say is thank goodness that nuclear physics was purely a theoretical exploration. The new science block - all two rooms plus a corridor - became part of our personal space. By now the interest in robust physical activity had given way to more academic pursuits. The new centre gave us a secluded spot for private study. However, there was still a large element of good natured larrikinism. We enjoyed each other's company and that of most of our teachers, but that didn't stop us from playing our own (what we thought of as) subtle games to challenge authority. Our new centre had a notice board under lock and key - it was there for school notices, not for student use. In fact we were too well behaved to deface the new paintwork by plastering notices on the wall, but we had our own solutions. One morning when staff walked past there was a picture of the "pin up girl" from The Sun neatly displayed behind the locked glass. We were delighted to see the mystified look on teachers' faces and hoped they'd be wondering how we'd gotten hold of a key. We hadn't. After a bit of judicious filing we knocked the pins from the hinges and removed the whole door, then put it all back together again without anyone knowing. Such are the antics of growing lads looking for distraction from study. As always, Mr Maddox, the sort-of senior master of the science block, was good humoured rather than dictatorial about it all. He grinned and carried on with normal routine. After a couple of weeks he said, "Do you think it's been there long enough?" So we took it down. The new centre became our home and we revelled in the freedom of our own space. For lunchtime diversions we enjoyed simple pleasures, mostly playing cards. This is where I rapidly advanced my education from playing Snap to playing Five Hundred, and I've enjoyed cards ever since. If you were doing Matriculation sciences at St Albans High School in 1966 then by definition you would have been an expert in 500. It's a shame it wasn't part of the curriculum, because I'm sure there would have been a long history of Exhibitions credited to the school's honour board during the 'sixties. In 1966 Sir Robert Menzies, touted as the most successful Prime Minister in Australia since Federation, finally decided to retire from politics. The Leader of the Opposition, Arthur Calwell, was quietly confident that the Labor Party would be elected to govern, but he had underestimated the effectiveness of the fear campaign propounded by the Coalition: this time the spectre of international communism and the threat of the "domino theory" were central to the Coalition's political campaigning. So it was that in January 1967 Harold Holt became the new Prime Minister with a landslide win in the election. Politics was not a strong interest in any of our lives as yet, partly because the right to vote was bestowed only on people who had reached their "majority", i.e. had already turned 21 years of age. We still had a few years to go, but it was a growing interest. The contract for the construction of the new assembly hall was signed in February, and thus the years of fundraising finally had a tangible result. The Assembly Hall was officially opened on 29 April 1969 by Lindsay Thompson MLC, Minister for Education. The final cost of $100,000 took several years to accumulate, but seems a pittance in today’s world of inflated prices. Many students of the 'sixties who stretched their imaginations in fundraising tasks have never set foot inside the building, so for you lot here is a view of the interior. In the meantime some things were being rediscovered. This group of seniors were the first since 1961 to get their act together and produce the next of the 'annual' Alba magazine. The magazine committee comprised of Leo Dobes, Joachim Simovic, Marilyn Huelett, and David Beighton, who deserve credit for restarting the tradition for annual school publications. Joachim was one of the school's keen photographers and is mentioned as being the "photographer in chief" in recognition of the service he put into group photos, sports, and school functions over the years. This year he received four commendations for his entries in the Inter-School Photographic Competition, while other awards went to Max Costa and Victor Maga. Also rediscovered was an interest in drama, and an "inaugural meeting of the St Albans Drama Club" was held under the guidance of Mrs Hewitt, almost as if the previous extensive history of drama activities had been completely forgotten. Sport wise, Ray Haynes played his first game for the Footscray Football Club, and thus became the first St Albans boy to play in a Victorian Football League while still at school, while Les Cameron played his first game for North Melbourne. Joe Darrul and Peter Plain were playing in the regional competition with the seniors at Sunshine Football Club. In Volleyball, Eddy Kruk, John Kruk, Stefan Gunew, Harry Swieboda, Richard Jarski and Harold Nowak formed an excellent team under the supervision of Miss Slater. In another arena, Miss Butler enhanced her sporting prowess by advancing from being the "orange girl" for the staff-student hockey competition to coaching the girls' basketball team. 1967 was altogether a more studious crowd of seniors, and people like Leo Dobes, David Beighton, and Marilyn Huelett set the trend with academic ambitions that would take them to international tenures and public service careers. Stefan Czyz set the scene by winning equal second prize at Matriculation level for the Goethe Prize, which was a competition for German poetry, while other notable achievers included Marianne Teichmann and Jutta Heymig. In the previous year it was Barbara Hertig and Karsten Richte who earned the accolades for the school. The Student Representative Council decided to formalise its own existence when people identified that it was difficult to operate effectively without agreed guidelines such as aims or a constitution. Maija Svars and Lindsay Chatterton, with some assistance from staff, drew up the constitution and aims, which were then publicised through the latest student publication, The Griffen. The social activities and partying went on unabated, though with a new crew and mostly out of school hours. Stones Green Ginger Wine was now the popular drink at parties; perhaps this was a trendier tipple than beer or flagon wine, but the fact it was dirt cheap was probably a significant factor in its selection. The prefects acquired their own little retreat in the old sciences wing near the geography room, where they could do their private study. Occasionally, a teacher would drop in to check that private study was indeed the main occupation of the inmates. Thankfully none of these trusting souls noticed the convenient hole in the floor that was used as an ashtray, but even that was just an occasional activity. And if the reconnoiterer did sense a more than normal fugginess in the air they were too diplomatic to notice it officially. Here the arguments initiated by Bruce Alcorn and Val Noone through the debating club and general discussions were tackled anew, whether it be “Is there a God?” or “Is there Life after Death?” Driven by the likes of Marilyn Huelett, Maija Svars, Jutta Heymig, David Beighton, Leo Dobes, Lindsay Chatterton, Peter Nowatschenko, and Marin Gunew, the debates and good times rolled on at school and into people’s living rooms and garages. Nowatschenko would bring his guitar to school and the group would sing Bob Dylan’s latest protest songs in their hideaway. The lusty voices given so freely when of their own initiative dried up suddenly when the group was forced to attend the formal music classes, an official demand which was just as quickly abandoned. There were about 20 of the regular crowd who would get together on a Saturday night as a social outlet, singing, debating, partying, discussing politics and Vietnam. Pete Seeger's songbook had a good going over on these occasions. In those days it wasn’t a case of open rebellion, but it was part of the awakening to dissent, the start of questioning parental and societal values, and a flirtation with left wing agendas - it was the forerunner to the 'seventies and the anti-war moratoriums. The year also had its negative aspects. The population was still increasing, but at a slower rate, as the estimated population reached about 13,000 people. But in October, St Albans suffered a major public relations setback when Professor Jones carried out his (I believe) infamous sociological scale of desirable suburbs in Melbourne and gave us the wooden spoon for being lowest ranking of all areas in Melbourne. That came as a shock initially, then people started to question what some of moral judgements behind the construction of the scale might have been, and to construct their own ideas about the identity and moral worth of their neighbourhood. It was the forerunner to some of the excellent proactive community development work that would occur in the region during the 1970s, and that is another bit of local-regional history that should be written down. The end of the academic year coincided with a national tragedy. On December 17, the Prime Minister of Australia, Harold Holt, disappeared while swimming on his own at Portsea. And that is the end of this review of the formative history of St Albans High School, which has continued to develop into the new millennium under its later name of St Albans Secondary College. Early St Albans photographs courtesy of Kon Haumann. School Assembly and Debutante photographs courtesy of Vanda Bognar. Sketch of St Albans H.S. taken from Alba 1957.